Your tears comfort your eyes in many ways. Water moisturizes; an outer layer of oils lubricates and prevents evaporation, and proteins help protect against infection. Dry eye strikes when your eyes can’t produce enough tears for lubrication or the moisture in your tears evaporates too quickly. Stewart Family Eye Care provides you with excellent care and expert treatment your dry eye syndrome. Dry eye occurs when your eyes either produce too little tears or poor quality tears. Millions of people experience the discomfort of dry eye symptoms—red, itchy, watery eyes, blurred vision, and the feeling of sand or grit in your eye. While many of these people are ultimately diagnosed with dry eye syndrome, millions more go undiagnosed. Frequently, people don’t even realize their symptoms are a result of dry eye. Since symptoms of dry eye are similar to other conditions such as eye allergies, people often don’t feel it’s necessary to visit their Boiling Springs eye doctor. However, it’s important to see your eye doctor if you do experience dry eye symptoms. Diagnosing dry eye requires a comprehensive eye exam. During this time, our eye doctors may do a few tests to help with the diagnosis including InflammaDry. This test represents the innovation being made in dry eye diagnostic technology. It is completed in-office with results given before you leave the office. InflammaDry is a quick test used to look for an inflammatory marker in tears called MMP-9. People who have higher levels of this specific marker are more likely to have dry eye. The doctor uses the InflammaDry device to collect a sample of your tears and within 10 minutes a blue or red line will appear to illustrate whether the results are positive or negative. Tear osmolarity has been shown to have the best predictive value for diagnosing Dry Eye Disease of any single test. TearLab’s sophisticated lab on a chip technology tests a tiny tear sample to measure Osmolarity or the salt content in the tears. The Doctor will test both eyes and will take the highest number of the two tests, to generate Your Osmolarity Number. Your Osmolarity Number gives doctors a meaningful measure of the health and stability of the protective tear film that covers the surface of your eyes. The number generated correlates with the severity of the disease. Equipped with the TearLab Osomolarity System, we can now use quantitative data at the point of care to aid in the diagnosis of DED and to improve our ability to manage these patients. IPL uses a high intensity xenon flash lamp to deliver light energy to the lower lid area, which is thought to liquefy congealed lipids while also sealing off blood supply which carry inflammatory mediators to the meibomian glands. IPL has been used successfully to treat patients with rosacea, a skin disorder that often has associated ocular problems such as MGD. Xiidra comes in eye drop form, and the prescription for most people will be a drop in each eye twice a day. 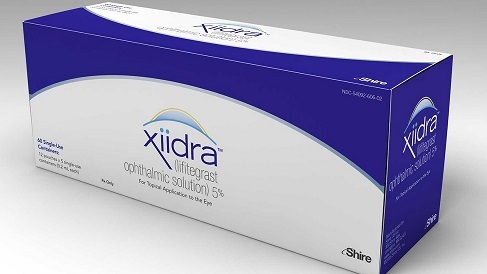 One main difference between Restasis, a decade-old medication used to treat dry eye, and Xiidra is that Xiidra is approved to treat not just dry eye signs but its symptoms as well. That distinction is because of the nature of the product. Xiidra stops a chemical chain reaction in the cells. When the drop hits the eye, the drop binds with proteins in the cells that stop the signals that would otherwise create many of the problems and symptoms of dry eye including itching, burning, pain, and redness. This effect can be noticed quite quickly! Xiidra was found to start working in test subjects as early as two weeks after the beginning of the application and most felt the difference within 12 weeks. That’s a huge jump forward from Restasis, which typically takes about six months before a real difference is felt by users. Your own real tears are a real possibility. RESTASIS®—the one and only prescription medication FDA-approved to help you make more of your own tears —is available in a multidose bottle. RESTASIS® and RESTASIS MultiDose™ help increase your eyes’ natural ability to produce tears, which may be reduced by inflammation due to Chronic Dry Eye. RESTASIS® and RESTASIS MultiDose™ did not increase tear production in patients using anti-inflammatory eye drops of tear duct plugs. Daily dietary supplementation with a unique combination of omega fatty acids (GLA, EPA and DHA) for six months is effective in improving ocular irritation symptoms and halting the progression of inflammation that characterizes moderate to severe dry eye. Contact lenses are great for correcting vision and are becoming more popular even for young patients. However, wearing contact lenses can cause dry eye, especially if they are worn for too long or if you don’t take care of them properly. Some brands are better than others, and wearing glasses seems to decrease the risk of dry eyes even more. Do you suffer from Dry Eye Symptoms? Schedule a Dry Eye Exam. Dr. Stewart answers your questions regarding dry eye syndrome and dry eye symptoms.